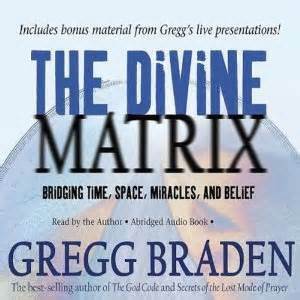 The Divine Matrix , as explained by Gregg Braden, is an intelligent Field of energy that western science has just come to understand. The most ancient traditions began with this understanding and spent 3,000 years devising the ways that it applies in our lives --sometimes called the Field. In 1944, Max Planck identified it as the Matrix. "All matter originates and exists by virtue of a Force. We must assume behind this force a conscious, intelligent Matrix." (The movie, The Matrix was based on some of this work by Max Planck....) Dr. Edgar Mitchell calls it Nature's Mind. Steven Hawking calls it The Mind of God. Lynn McTaggert calls it the Field. This book by Gregg Braden, says that not only are we a part of this matrix, but we have the ability to communicate with this divine matrix in ways that seem miraculous in the Western world. He spent time in the monasteries in China, Egypt, Bolivia and Peru because they have maintained communication with this divine matrix. Gregg Braden assures us that this was part of our culture until the instructions were edited out of our Biblical text in the 4th Century. When he began studying the Dead Sea Scrolls, Braden found that we once had as part of our history the same teachings that he was only finding in these out-of-the-way places. Afterwards, their practices began to seem very strange to westerners. We called them primitive practices. Gregg Braden explains that we got the Reader's Digest condensed version of the Bible. "Ask and ye shall receive." What Jesus actually says is "Be surrounded or enveloped by your desire so that your joy can be full." -- Be this way as if these things have already happened. The self empowering books in the Bible were the ones taken out in the 4th century at the Nicean Council. The power of human emotions to rearrange the atoms and to interrupt the flow of time and space, this was in the descriptions of the books taken out of our traditions, although this was never taken out of other traditions, such as Native American and those living in Peru and in the Andes. In our Book of Genesis, there is one line on the creation of the human being. In the original, there were many pages; our souls were created separate from our bodies. The original body could not contain the light and power of the soul and had to be redesigned. The original intent was to share the wisdom. The intent of the council was political. In the letters of some of the Bishops, they questioned this editing and deletion. In the Gospel of Thomas, now in Egypt, Jesus is telling us about prayer. It is a language that communicates with this intelligence he calls the Father. If you want health or wealth, "be" surrounded and enveloped by these things so your feeling can be completed. It is an unbiased matrix, Gregg Braden reiterates, that mirrors back to us what we create in our lives. Our thoughts imagine what we would like. Our hearts breathe life into this when powered by our feelings. This has been discouraged by males in our society. Could this be part of the reason the Nicean Council deleted these sections from the Bible? I highly recommend reading this insightful book.